A few days ago, I was having lunch with my friend Bob. At some point in the conversation I asked him where he would like to live if he ever retired. He told me that he had already decided that it would be on Florida’s gulf coast. He wouldn’t be the first person to make such a choice. It’s certainly easy to be seduced by pictures of the beautiful beaches in places like Sanibel island. I had often wanted to visit there myself. All those sea shells to collect! Nevertheless, I pointed out to him that these days moving to Florida might not be such a good idea. As I thought about the current situation on Florida’s gulf coast, a picture entered my mind-it was a painting by Max Ernst. The surrealist painter Max Ernst arrived in the USA on July 14th 1941 after fleeing Nazi occupied France. Once he had arrived several important things happened to him ,not the least of which was his marriage to the heiress Peggy Guggenheim. Ernst wasn’t the only European painter who had fled to America and he joined an extremely distinguished group of artists who had established a prominent contemporary art presence in New York. This included Yves Tanguy, Marc Chagall, Fernand Leger, Andre Breton, Piet Mondrian, Andre Masson and Jacques Lipchitz. The year after his arrival Ernst completed what was to be one of his most famous works –“Europe after the rain II”. The picture represented what Ernst thought might be left of many German cities by the end of the Second World War. Ernst went back and visited after the war and said that his painting certainly did reflect what he found there. However, the painting also suggests a more general conclusion. It depicts what appears to be the ruins of a “civilization”. The humans that are left appear to have returned to some primitive form of existence, as suggested by their attire. What is more, the ruins have been completely taken over by invasive organic matter of a seemingly malevolent nature. What are these life forms? We do not know, but they seem to have availed themselves of the opportunity of taking over the space abandoned by humans. Or perhaps they may even have been the cause of the decline of the civilization by choking it to death. One can see vistas that look rather like this in the American south these days where invasive kudzu weeds have covered everything in death like shrouds. One idea that we can take away from Ernst’s painting is that an overwhelming invasion of foreign organic matter might presage the decline of human civilization. Which brings us back to a consideration of current events taking place on Florida’s gulf coast. Unfortunately, the latest pictures of that earthly paradise are in every way as shocking as Ernst’s painting. Rather than golden sands, blue seas and gorgeously tanned vacationers, we are now presented with something that is altogether the opposite of this. The clear blue sea has turned a cloudy rusty brown. The beaches are littered with the stinking rotting carcasses of dead and dying creatures- including fish of all types, even sharks, as well as seabirds, manatees and turtles. Nothing has been spared. The vacationers have fled leaving a picture of desolation, death and destruction. As described by the Chicago Tribune on August 12th of this year, there are “Tons of dead fish. A smell so awful you gag with one inhale. Empty beaches, empty roads, empty restaurants.” So what has happened in Florida? Did somebody detonate a nuclear device? The answer is actually even more depressing. The beaches of the Florida gulf coast- fancy a stroll? air resulting in a poisonous cloud of death. The fact is that, although HABs are not unknown in the waters of Florida and Texas, they are becoming more and more common and getting worse and worse. The HAB hugging the Gulf coast of Florida at the moment is an absolute whopper, stretching hundreds of miles along the coast ,moving slowly northwards. Nobody knows exactly where it will end up or exactly when it will dissipate. Perhaps it will never dissipate. HABs aren’t an altogether new phenomenon. There are reports of fish kills associated with HABs from early in the colonization of the Americas. including one by Fray Diego Lopez de Collogudo, a Franciscan monk and historian in Yucatan, Mexico, who documented a massive fish kill that occurred in 1648. However, the first really modern account had to wait until around 1875 when one Nunez Ortega reported from Veracruz on the Mexican coast. a dry cough caused by an irritation of the throat. dead fish had washed ashore along the beach. Of course, in recent times, much more precise scientific data has been collected about mass fish killing events and their true scale appreciated. One of most severe red tides to affect the Texas coast in modern times occurred in 1986. It first appeared as a patch of brown, rusty colored water coming ashore on the coast near Galveston on 27August 1986. 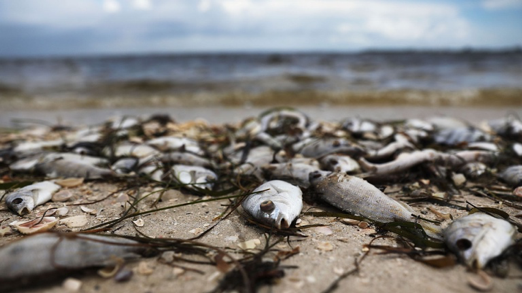 By the next day people began to report breathing problems and huge numbers of dead fish were observed washing ashore. Local investigators estimated 100,000 dead fish per mile along the beach and the death of a total of 22.2 million fish! 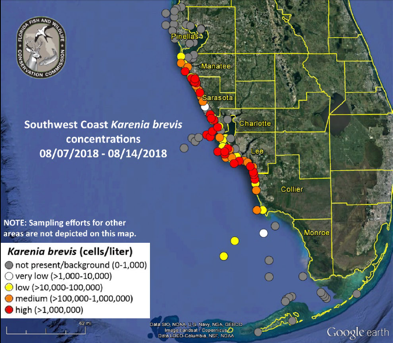 The normal levels of K. Brevis in the local Gulf of Mexico waters run around 1000 cells per liter of sea water, but during an HAB, these swell to over a million cells per liter. These organisms then enter the marine food chain. Humans who eat sea food and fish contaminated with K.Brevis suffer from the symptoms of what is known as “Neurotoxic Shellfish Poisoning” or NSP. This can lead to the death of marine mammals such as manatees and dolphins as well as fish and birds, whereas it has not been shown to be fatal as yet in humans. Nevertheless it can be extremely debilitating. NSP causes a range of signs and symptoms, both neurological and gastrointestinal. Most individuals report mild to moderate nausea, vomiting and diarrhea. Numbness and tingling in the lips, mouth and face and in the extremities are also common. These effects, known as “paresthesias”, are usually described as feeling like the “nerves are on fire or ants are crawling and biting all over.” Other symptoms may include ataxia, overall loss of coordination, partial limb paralysis, reversal of hot and cold sensations, slurred speech, headache, pupil dilation, fatigue and a general feeling of disorientation. Clearly this is a syndrome associated with a wide variety of symptoms, suggesting a profound attack on the nervous system in general. 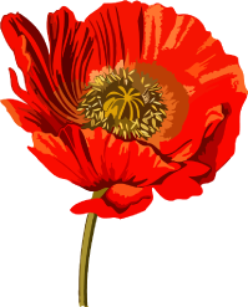 NSP is also associated with respiratory disease in humans and animals. Because K. brevis is an unarmored dinoflagellate, that is it has no protective shell, it is relatively fragile and easily lysed by the actions of waves and winds. The lysed cells release toxins into the water which can then be aerosolized by coastal wind, wave and surf and breathed in by humans and animals. Throat irritation, sneezing, coughing, itchy and watery eyes, and burning of the throat and upper respiratory tract are common in beach goers during a red tide of this type which is being blown onshore. During these HABs a large increase in pets turning up at veterinary clinics with breathing problems has also been noted. The toxins responsible for NSP have been isolated. They are known as brevetoxins. Just look at their chemical structure. You don’t have to be an expert to see that these molecules are absolutely enormous. To make a molecule like this from scratch in a laboratory would be an absolutely heroic task. But with billions of years of evolution at their disposal organisms can produce some amazing structures. Even by these standards, however, brevetoxins are chemically extremely exotic. They look like ladders and are known in chemical terminology as polyethers. How do they produce their effects? The explanation lies in an understanding of the manner in which nerve cells work. The function of a nerve cell is to send information from one place to another. What is the physical form of this information? The answer is that it takes the form of electrical impulses that travel along nerve fibers. In a very elementary sense one could compare this to the functioning of an electric circuit. The next question is how a live cell, like nerve cell, can generate an electrical impulse? An electric current is due to the movement of electrical charges. In the case of the nerve cell high concentrations of positively charged sodium ions exist outside of the cell and high concentrations of positively charged potassium ions exist within the cell. Normally the nerve cell membrane is impermeable to sodium ions and has a limited permeability to potassium. Certain stimuli can cause the permeability of the cell membrane that surrounds a nerve cell to change so that it becomes permeable to sodium ions. During this process sodium ions flow into the cell through special protein channels known as sodium channels designed for just this purpose. As the influx of sodium reaches its peak ,another set of channels that are permeable to potassium ions opens ,and these ions flow out of the cell. This sequential influx and efflux of positively charged ions produces a characteristic electrical impulse known as an “action potential” which can be transmitted by the nerve cell. To produce this effect in a biologically appropriate manner everything must be perfectly choreographed. The protein channels for sodium and potassium ions must open and close at exactly the right time. If they don’t then the nerve will not function properly. And this is precisely the process that is disrupted by brevetoxin. The toxin sticks to sodium channels and makes them open up when they shouldn’t. Moreover, once open, it makes the channels stay open for much too long. When this happens the nerve cell becomes “hyperexcitable”. That is to say it fires too many action potentials. The result is that normal nerve cell function is completely disrupted producing problems for our heart, gut and other organs. For example,when breathed in as an aerosol the toxin disrupts the nerves that control our lungs. If the Florida red tide wasn’t bad enough, it isn’t the only thing that’s brewing in the waters near Florida these days. Just around the corner in the Caribbean ,it isn’t HABs that are the problem, it’s seaweed. Seaweed is normally fine. We all expect to encounter a bit of seaweed when we go down to the beach. It even helps to add the general marine atmosphere prevailing at any good seaside holiday resort. But that isn’t what is washing up on the beaches of many Caribbean islands at the moment. In 2011, massive rafts of brown Sargassum seaweed started to appear on beaches across the Caribbean, filling the air with the stench of rotting eggs. Sargassum is normally found in the open waters of the Atlantic and especially in the Sargasso sea. However, the seaweed that invaded the Caribbean, although superficially similar, may actually be a different species which didn’t come from the Sargasso sea to the North but from the coast of Brazil to the South. Now Sargasso blooms in the Caribbean area have become a yearly feature of life down there with massive, stinking, sulfurous mats of seaweed choking the beaches, producing mounds of rotting matter in some places 10 feet deep. Although it was originally hoped that the 2011 seaweed invasion was just a “one off”, that hasn’t proved to be the case. In Fall of 2014 there were reports of 3-4 foot thick mats collecting along Caribbean coastlines and piling up on beaches. By August of 2015 these mats had grown to as dense as 10 feet thick. 2018 has witnessed the worst infestation yet. Now vast swaths of beaches are covered in piles of sulfur stinking dying biomass. Under normal conditions, Sargassum is a vital part of the oceanic ecosystem. Numerous species of fish like tuna, rely on the food provided by the seaweed. Birds, turtles, and scores of invertebrates also rely on Sargassum in one way or another. But when Sargassum blooms to produce astronomically large mats, as in the present infestation, it becomes highly problematic. For example, sea turtle nests become fouled with the stuff and the dense tangles reduce the mobility of larger animals including sharks and rays. Incoming mats of Sargassum smother sea grasses and coral reefs, while fishermen struggle to get their boats into the water. The Sargassum tangles up their motors, their engines, their nets and their lines. What is more the large mats of Sargassum cut off light and nutrients from the water, creating oxygen deprived dead zones. The Sargassum is associated with bacteria that make hydrogen sulfide gas further toxifying the waters and resulting in the smell of rotten eggs that is associated with seaweed infested beaches. What is more removal of the seaweed is time-consuming, expensive and can damage the beaches. 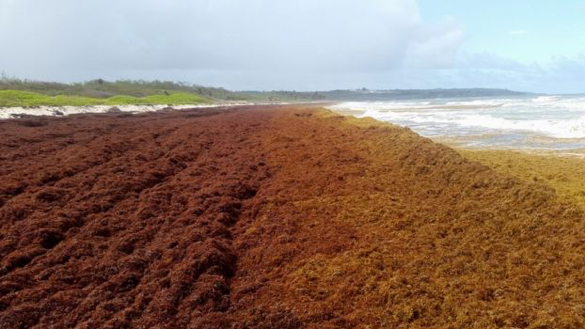 The Sargassum invasion in the Caribbean has been declared a disaster by several of the island nations as they struggle to deal with a problem that shows every sign of overwhelming them. Caribbean island beach summer 2018. Where’s the sand? And then there are the jellyfish. Jellyfish are probably not at the top of most people’s list of favorite animals although, like all other creatures, they have their place in the planet’s ecosystem. We know that if we encounter one while swimming in the ocean we could get anything from a small to a hefty sting, depending on the jellyfish species in question. Nevertheless, most of us would not let this somewhat remote possibility put us off going swimming if we are on vacation. But how would you feel going for a paddle and encountering several million jellyfish all at once? This nightmarish scenario is something that, as with HABs and seaweed blooms, has become a reality and is happening with increasing frequency. Particularly since the 1990s, there have been jellyfish problems in the oceans all over the world. 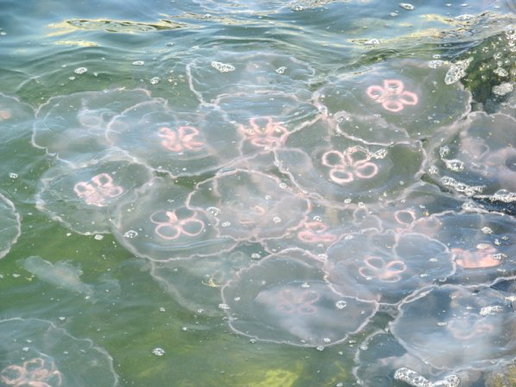 Gigantic explosions of the jellyfish population creating infested areas of water which can extend for many miles are not things you can easily ignore and are likely to be highly problematic. Fishing can be disrupted because the masses of jellies suffocate fish and tear up nets. The vast numbers of jellyfish also compete with fish for food. The arrival of millions of jellyfish on the beach is likely to discourage tourism. The jellies can also clog cooling water intakes at power plants, causing power reductions or shutdowns. Consider some examples that have occurred over the last few years. Nuclear power plants and desalination plants in Japan, Israel and Florida, have been forced to shut down because jellyfish were clogging up their water intake pipes. In Israel, for example, Rhopilema nomadica, the nomad jellyfish, has been the species responsible. These jellies are actually indigenous to the tropical areas of the Indian and Pacific Oceans. However, once the Suez Canal was constructed they had a nice new conduit to the Mediterranean. So, they swam through the Suez Canal and invaded the Levant coast in the 1970s where they found the conditions very much to their liking. The European Union now lists Rhopilema as one of the worst invasive species. In retrospect one cannot be all that surprised. Ships like to go through the Suez Canal, so why not jellyfish and who knows what else? The world is getting “smaller”, that is more connected. We create these multiple connections with ourselves in mind but we should not be surprised if other creatures are making use of them as well. The entire Irish salmon industry was wiped out in 2007 after a bloom of small purple jellyfish attacked the fish cages. Billions of small jellyfish, known as Mauve Stingers, flooded into the cages about a mile into the Irish Sea, The jellyfish covered an area of up to 10 square miles and a depth of 35 feet. The managing director of the Irish salmon fishery said he had never seen anything like it in his 30 years in the business. “The sea was red with these jellyfish and there was nothing we could do about, it, absolutely nothing,” he said. Perhaps the most extraordinary blooms have been those occurring in waters off Japan, the home of refrigerator-sized gelatinous monsters called Nomuras, some weighing in at nearly 600lb and measuring 6.5ft in diameter. Blooms of these creatures have swarmed in the Japan Sea annually since 2002, where they have greatly disrupted the fishing industry resulting in billions of yen in losses. In 2009, a fishing trawler capsized as the crew tried to pull in nets filled with jellyfish dumping the crew into a sea filled with giant jellyfish each armed with thousands of flaying poisonous tentacles. Sea off the Florida coast. How about a swim? normal constituents of the ocean waters off Florida, but a few Moonies is not what are presently showing up on the Florida coast this year. The sea is teeming with them resulting in a large number of people vacationing in the area being stung. In the two weeks from June 10-25, more than 4000 people received nasty stings. The local newspapers were filled with advice about what to do if you got stung- “Officials are recommending anyone stung by a jellyfish to exit the water and flag down a lifeguard truck or go to a staffed tower. Jellyfish stings can be painful and a lifeguard can rinse the area with vinegar, which is a common treatment”. Of course all of this raises some important questions. Are these phenomena related? If so, what is the cause? The answers are now, by necessity, becoming available. There are a variety of actions, all of which are due to human behavior, which have contributed to these problems. Translocation is one of these. Most species have evolved to live in a particular environment where things are in a delicate balance between prey, predators and other factors. Let’s say the jelly population is normally kept at a particular level because they are the prey of certain fish. If these jellyfish are inadvertently transported in the ballast water of ships to some completely different part of the world, then it is quite possible that the same conditions will not apply. Perhaps there will no longer be there normal predators around and so the population might then explode because there is nothing to control it. For the same kind of reasons over-fishing which depletes the normal population of certain predator fish might also lead to the explosion of species that are usually controlled by their predators. Then, of course, there are factors connected to climate change. Warming waters often favor the growth of certain populations. There are also changes to the composition of the oceans leading to nutrient rich, low oxygen conditions that are also favorable for the growth of different species. Much of this is due to the run off of fertilizer rich waters from developed countries into the oceans. But there are also things that you would never normally think about. It seems, for example, that dust picked up from the Sahara and transported across the Atlantic, is an important source of minerals for the Amazon and Caribbean regions. As these winds change as a result of alterations in the global climate, so does the composition of minerals they transport to the Americas. Perhaps mankind may be forgiven for not having foreseen the consequences of some of his actions. But nowadays there is no excuse for burying one’s head in the sand. Effective coordinated action is required -and soon. So what can you expect if you are vacationing or retiring to Florida these days? Apart from the fact that the rising seas and the coming inundation will ensure that some areas of Florida ,such as the Keys ,won’t actually be around in a few years, you will be subjected to toxic HABs that will make you really sick, you will be stung by gigantic jellyfish and you will be smothered by tons of stinking seaweed, as the once pristine Floridian seas turn into cesspools of toxic slime. Does that sound like fun? Frankly, retirement in downtown Detroit is beginning to seem like a much more attractive option.